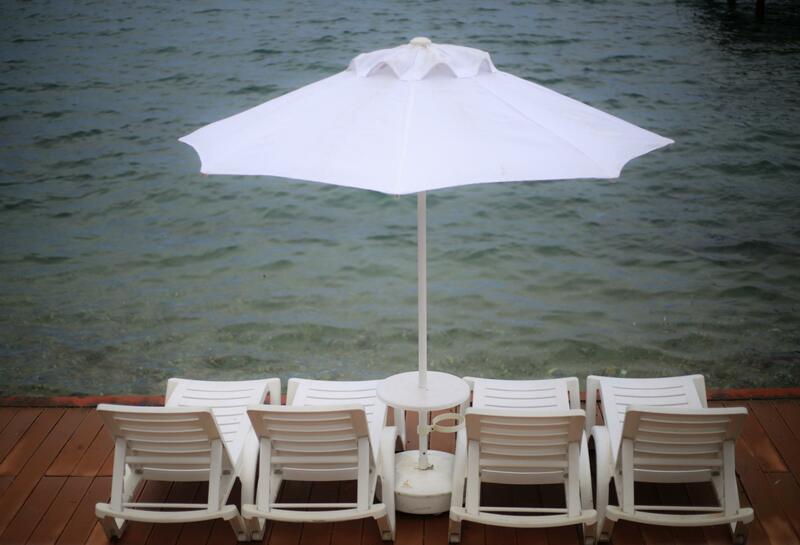 This resort is situated direct on the beach, close to the town centre of Bodrum. Links to the public transport network are located in the immediate vicinity. 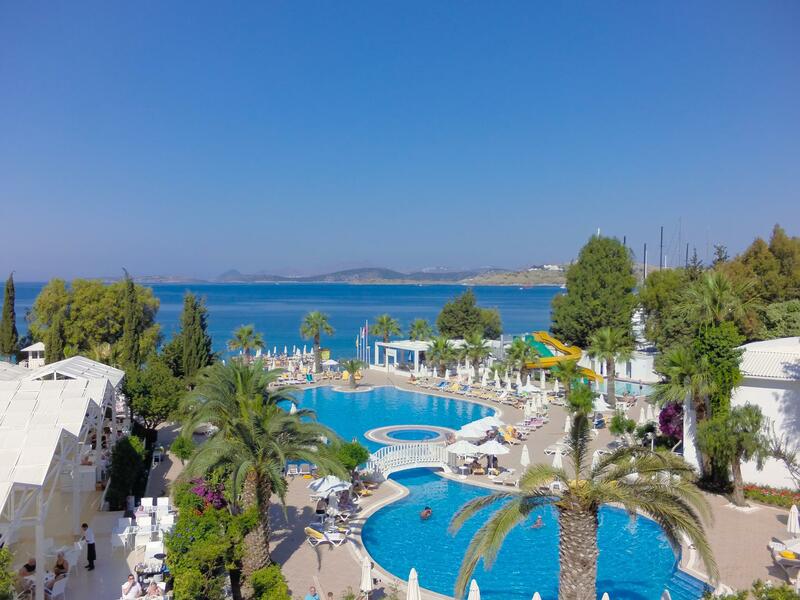 The nearest bars, pubs, nightclubs as well as shopping facilities are 1.5 km from the complex.This holiday village comprises a main building and four 2- storey neighbouring buildings with an interconnecting footbridge linking all the buildings. There are a total of 348 rooms. The hotels facilities include a lobby with 24-hour reception, a hotel safe, a currency exchange booth, a café, a small supermarket, shops, a hairdresser, a games room and a public Internet terminal. Those who wish to make use of the air-conditioned restaurant with seating both in and outside (including highchairs for children) are always made welcome. Laundry and medical services round off the services on offer.The rooms come with a bathroom, a hair dryer, a direct dial telephone, satellite/cable TV, minibar (fee), Internet access (fee), air conditioning, heating and a hire safe. All rooms are tiled. 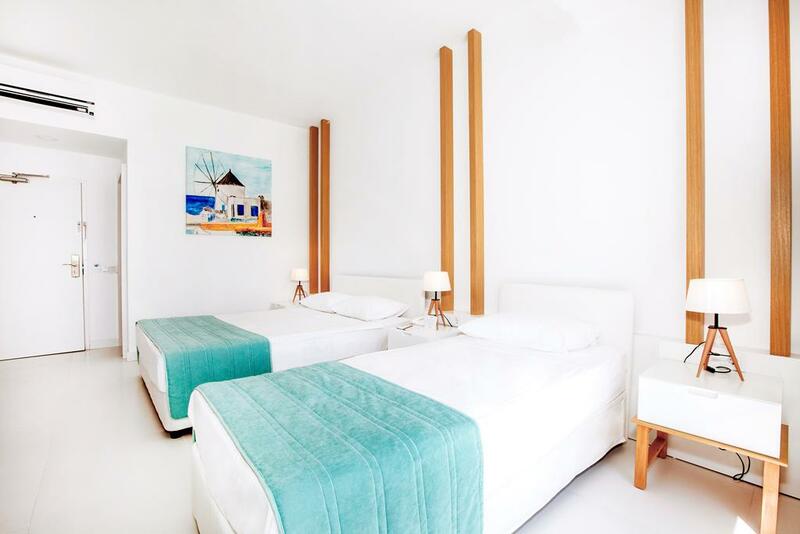 Each of the apartments comes with combined bedroom/ lounge area and a separate bedroom.There are 3 swimming pools (one for children and other indoor), sauna, Jacuzzi, steam bath and gym. Sports facilities available include banana boat rides, water-skiing, jet skiing, diving, wind surfing, canoeing, pedalo hire, archery and gymnastics. In addition to this list, basketball, beach volleyball, billiards and minigolf can also be played. Guests may relax and enjoy a massage. Daily entertainment programs as well as weekly Turkish evenings are put on for guests' entertainment.Guests may select their breakfast, midday and evening meals from ample buffets. Furthermore, special dietary requirements can be catered for as well as the preparation of individual-specific dishes. It is possible to book an all-inclusive stay.American Express, MasterCard and VISA are accepted as methods of payment. 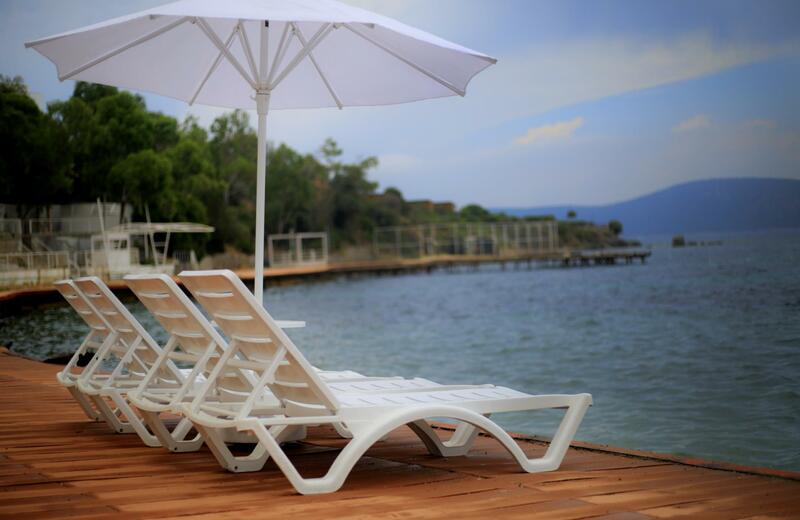 This resort is situated direct on the beach, close to the town centre of Bodrum. Links to the public transport network are located in the immediate vicinity. The nearest bars, pubs, nightclubs as well as shopping facilities are 1.5 km from the complex. This holiday village comprises a main building and four 2- storey neighbouring buildings with an interconnecting footbridge linking all the buildings. There are a total of 348 rooms. The hotels facilities include a lobby with 24-hour reception, a hotel safe, a currency exchange booth, a café, a small supermarket, shops, a hairdresser, a games room and a public Internet terminal. Those who wish to make use of the air-conditioned restaurant with seating both in and outside (including highchairs for children) are always made welcome. Laundry and medical services round off the services on offer. The rooms come with a bathroom, a hair dryer, a direct dial telephone, satellite/cable TV, minibar (fee), Internet access (fee), air conditioning, heating and a hire safe. All rooms are tiled. Each of the apartments comes with combined bedroom/ lounge area and a separate bedroom. There are 3 swimming pools (one for children and other indoor), sauna, Jacuzzi, steam bath and gym. Sports facilities available include banana boat rides, water-skiing, jet skiing, diving, wind surfing, canoeing, pedalo hire, archery and gymnastics. In addition to this list, basketball, beach volleyball, billiards and minigolf can also be played. Guests may relax and enjoy a massage. Daily entertainment programs as well as weekly Turkish evenings are put on for guests' entertainment. Guests may select their breakfast, midday and evening meals from ample buffets. Furthermore, special dietary requirements can be catered for as well as the preparation of individual-specific dishes. It is possible to book an all-inclusive stay.